We build all kind of fireproof curtains fulfilling with all security codes depending of the instalation country, please contact us to give you further information. Our fireproof curtains are built to your specific needs and meassures. Surpassing national fire protection standards. One-of-a-kind material that keeps away the heat, smoke and fire from the audience. It means it exceeds fireproof standards. Keeps away smoke or cast too little. Non cancerogenic. An attainable instalation in new theatres or auditoriums and/or upgrade for your theatre or auditorium. Fireproof Curtaings are built for installations in auditoriums, schools and theaters worldwide. Our systems can be built in almost any size and specification required. All our curtains are available with Security Pads and Smoke Seals. 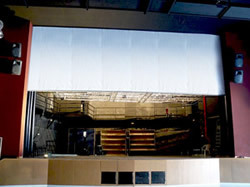 Most of the Municipal and State Goverments require one fireproof curtain on the proscenium that can be operated manualy or automatically when installed. If a fire occurs, once down, this curtaing must provide a barrier against flames, heat and smoke between the auditorium and the stage. This barrier allows a safe evacuation, also holding the fire. Our curtains are build from an exclusive and pattented material, it's Asbesto-free made 100% of glass yarn that has been treated with a special compound that allows it to withstand excedingly high temperatures. When it has been exposed to 2000° on a test, it doesn't shows flame or smoke penetration, not even a slight of glow is visible from the opposite side of the flames after 30 minutes of the test. Chemically resistance to most acids, alkalines and solvents. Not affected by bleaches and mold. This system is recomended when the tower height is grater than 2 times the stage opening height. It requires a counterweight to balance the curtain's weight. It's possible to motorize it using a winch instead of a main pulley. This system is recomended when the tower height is less than the stage's opening height, it's opperated by a fireproof brail winch, manual or motorized.